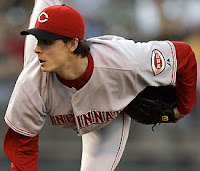 Homer Bailey is extraordinary. He's an enigma wrapped in a riddle. First, why would a pitcher voluntarily adopt the nickname "Homer"? Maybe it's high time he makes the switch back to David. Second, I'm not sure anyone in baseball gets less with more than he does. While his problems seem somewhat clear, it's still mindboggling that he has as little success as he does. Given his less than impressive 4.65 BB/9 mark on the season, it's easy to see that control is not a strength. Still, I'm not sure that stat quite illustrates the problem. As problematic as his control has been, it pales in comparison to his command. Control problems mean an inability to throw strikes, while command is the ability to spot your strikes inside the zone. Control problems lead to a higher number of base runners due to the extra free passes. Command problems lead to ineffectiveness in the strikezone, which can result in extra baserunners from a higher rate of hits. Obviously, Homer is plagued by both. Homer REALLY struggles to hit his spots inside the strikezone. That may even be too kind. 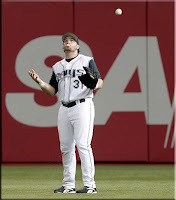 In fact, I'm surprised Ryan Hanigan doesn't strain his arm with the amount of reaching he does to catch Homer's pitches. Hanigan is always reaching a LONG distance to corral Homer's pitches. It's not exactly a rare occasion to see Hanigan set up on one corner only to have to reach all the across the plate to the other corner to catch the ball. How rough is his command? Well, homeplate is 17 inches wide. So, when Hanigan is reaching from corner to corner, he's reaching a foot-and-a-half or more. Great pitchers miss their spot by only a couple of inches either way. Homer misses by a foot or two. Suffice it to say, it's difficult to be effective with that type of command. Many of the pitches that Homer throws are a complete waste. They are so far off the plate that they are easy pitches to take for the batter. As soon as the ball leaves Homer's hand, the hitter knows it's off the plate and he can take it. Not only are those pitches worthless in and of themselves, but they also fail to do anything to setup the next pitch. They are so far off of what Homer is trying to do that they prevent Homer from effectively sequencing his pitches. As the saying goes, "Hitting is timing and pitching is upsetting that timing." It becomes much more difficult to upset that timing when you can't setup your pitches. How bad is it? Well, he actually walked Bengie Molina twice in the same game last week. That's bad. Really bad. And, frankly, not easy to do. The other problems that leaps out at me on Homer is that his offspeed pitches simply aren't consistent or effective. All to often his once hyped power curve rolls and hangs. The vaunted splitter is used too infrequently and doesn't always have the nasty bite that it needs. He's throwing a fastball 68.7% of the time that averages 94.4 mph. He throws a cutter/slider 14.1% of the time that averages 86.3 mph. He throws the curveball 8.3% of the time averaging 76.6 mph. As for the splitter, he throws that 7.3% of the time at an average of 88.6 mph. So, the vast majority of his pitches clock in at 86 mph or higher. Working in the changeup more often to give the hitters a slower look might be a good idea. There are a number of positives that actually give me reason for optimism. In fact, I'm more hopeful about Homer than I have been in quite some time. First, Homer has demonstrated the velocity that he has long been reputed to have. In 2007, Homer's fastball averaged 92.4 mph. In 2008, it averaged 91.5 mph. In 2009, it is up to 94.4 mph. In the past, Bailey didn't demonstrate the type of electricity you expect to see in elite pitching prospects. In 2009, he has flashed it a bit. Another positive that really jumps out at me is the changes in his mechanics. There were reports that he was refining his mechanics in the minors and I really like the results. Homer has eliminated the stabbing motion from his arm swing. Before the change, Homer would stab at the ground with his pitching hand after breaking his hands. Now, Homer has a much more fluid and fundamentally sound arm swing. After breaking his hands, he uses a fluid half-circle arm action. He breaks his hands and swings his arm down from above his left thigh, past his right hip, and then up into the throwing position. And, of course, he still has the free-and-easy arm action. He has a loose and easy throwing motion, which makes it look like he's not a max effort type pitcher. Finally, and most importantly, he's still a light-switch guy. He has the type of upside that could make him really special once he figures it out. Unfortunately, he hasn't done it yet, but it could still happen at any time. At this point, he is clearly struggling with his arm slot, but perhaps that is not unexpected given the overhaul of his mechanics. It's not easy to make changes to the throwing motion you've used your entire life, so maybe he just needs more time to get comfortable and find a consistent arm slot. If he can do that, then he could start to unlock his true potential. At this point, the best hope for the Reds is that Homer Bailey is the next Edwin Jackson. Some guys simply take longer to figure it all out and put it altogether. Jackson was a very highly regarded pitching prospect in the Dodger organization, but didn't put it together until this year in his age 25 season. Edwin was similar to Homer. Big time power stuff, but no ability to command it. Hopefully, Bailey can follow in Edwin's footsteps, but do it before he changes organizations twice. Well, Reds fans everywhere have fallen into their annual Dog Days of Summer malaise as the team has again dropped off the pace. It hit me today how much I miss seeing the team play meaningful games late in the season. The Reds haven't sniffed the playoffs since October 4th, 1999, when the Reds squared off against the New York Mets to in a one game playoff to determine who would play in October. Unfortunately, Al Leiter pitched a two-hit shutout against the Reds, sending them back to the Queen City with hat in hand. Unfortunately, since that game the Cincinnati fans have witnessed nothing but ineptitude and known nothing but frustration. What usually happens this time of year is that fan frustration leads to finger pointing at individual players and the front office. I'm certainly not above it and even Hall of Famer Hal McCoy got caught up in it this year. Fans put so much time, energy, passion, and money into their team that they almost live and die with that team. They identify with the organization and want it to succeed. It's certainly understandable that frustrations would run high after a decade of incompetence, but finger pointing isn't productive or worth the energy. It may feel good, but it does little to move the discussion forward. The problems obviously run deeper than simply Willy Taveras and Dusty Baker. So, rather than looking at the problems on a micro-level, let's take a deeper look at the problems in the organization. What would it really take to rebuild the Big Red Machine in this day and age? What type of business and baseball strategies need to be implemented? Obviously, the financial structure of the game has changed and competing against the large market juggernauts is a challenge that the Big Red Machine didn't really face . However, let's see if we can identify problems that plague the organization and find potential solutions to make the Reds the type of organization for which we all want to root. I'm not sure how many total steps it'll take, but there are 3 clear phases. Phase 1 involves increasing the financial resources available to the organization. Phase 2 requires improving the typical return-on-investment of the organization's financial resources by making more strategic and better informed decisions. Finally, Phase 3 involves maximizing the performance of the assets brought into the organization. In short, the organization needs to strengthen its revenue stream, make better investments with the revenue it generates, and ensure that the assets it brought into the system are performing at peak levels to ensure a healthy return on investment. Now, I actually wrote Step 1 back in May of 2008, but other topics prevented me from following up on it. Unfortunately, the topic is still relevant in 2009, so it's time to pick it up again. When the Reds signed Jonny Gomes this offseason, I called the acquisition the "best move of the offseason." Of course, I took a bit of flak for that when the Reds' "braintrust" decided to send him to the minors to start the season, but as the injuries piled up in Cincinnati the Reds finally gave Gomes the opportunity. He's definitely making the most of it. In fact, Gomes is performing so well that it's time to add his name to the discussion of possible starting outfielders in 2010. Whether or not he is actually deserving of the job, he at least deserves to be in the discussion. For a team that has as many offensive woes as the Reds, it's impossible to defend keeping Gomes in the minors until May 22. When I wrote about the acquisition of Gomes, I stated that the organization's decision as to whether to sign the Gomes or Willy Taveras would reveal much about the organization's method of valuing players. Ultimately, they signed both, but the manner in which they have utilized them still revealed a great deal about the organization's valuation of players. Not surprisingly, given that Dusty is the manager and Jocketty was run out of St. Louis in part because he couldn't accept the organization's efforts to incorporate statistical analysis into its operations, the Reds prefer early count, slap hitters whose speed gives them the perception of actual value. Willy T does have one great attribute: he is so fast that his speed blinds people to the fact that he's a terrible baseball player. Still, now that Willy T. has flopped like most knew he would, he has left Gomes standing as the more intriguing case. On the season, Gomes has a slash line of .270/.351/.567/.919 in 206 plate appearances. True to his reputation, Gomes has been better against southpaws (.352/.418/.620) than northpaws (.234/.323/.541). Still, he hasn't been a slouch against the righties and I'm not convinced that he can't be at least competent against righthanders. As for his peripherals, Gomes looks pretty solid. Both his walk and strikeout rates are actually a bit off of his career rates. (BB%: 9.0% in 2009, 10.5% in career) (K%: 34.1% in 2009, 32.8% in career). His BABIP is probably unsustainable at .343, as his line drive rate stands at 19.0%. Still, Gomes is making a lot of hard contact and is reaping the benefits of it. His HR/FB mark is a massive 25.9%, which will likely decrease but isn't simply luck. Unlike pitchers, hitters have some measure of control over the percentage of their flyballs that leave the yard, so Gomes has earned that mark. As for how he handles various pitches, Gomes has feasted on fastballs and curveballs, but struggled against splitters and sliders. Unfortunately, Gomes has been about as advertised on defense. The sample size is too small for the defensive metrics to be meaningful, but they are pretty much in line with his past defensive performance. He's just not a good defensive outfielder and is better suited to a DH role. Still, after years of Adam Dunn, the Reds could conceivably put up with Gomes' defense, if they so chose. However, his defensive shortcomings will likely preclude him from any chance at being a full-time starter in the future. Overall, Gomes has been a nice addition and a productive player. He's certainly received the benefit of playing in GABP (OPS Home: 1.053, Road OPS: .820), but over a larger sample size that differential will likely reduce. I wouldn't be surprised to see his home OPS fall and his road OPS rise. In 2005, Gomes had what I thought was a breakout year. He posted a .282/.372/.534 slash line without much of a platoon split. Unfortunately, up until now, 2005 has looked much more like a statistical anomaly than an actual breakout season. Still, Gomes has always had the ability at the plate and there's really no reason why he can't post a couple more 2005 type seasons. As sports psychologist Bob Rotella once wrote in a golf context, a hot streak isn't a fluke, but rather a glimpse of a player's true level of performance. At the very least, Gomes makes a nice bat off the bench or a platoon outfielder, but he arguably has enough upside to be a bit more than that. Regardless of whether he reaches that upside, he could still be a nice role player for the Reds. Still, in 2010, it'll be a crowded outfield for the Reds, so it seems likely that Gomes will once again be the odd man out. Whatever happens in 2010, Gomes has been a bright spot in an otherwise gloomy season for the Reds. Pinch-hitter Freddie Lewis hit a ball to dead center. As he has done so often this year, center fielder Willy Taveras broke poorly on the ball, running laterally to his left before realizing the ball was over his head. It fell for a double. He doesn’t get on base. When he does he doesn’t steal when it is needed. He was brought in to be a leadoff hitter and couldn’t do it and is now batting second. And he is below average in the field. What can Taveras do? He has a nice stereo set in the clubhouse that plays loud, headache-inducing salsa music. And holy cahooties. Taveras just hit a ground ball to the mound and trotted toward first base. Didn’t run. Jogged. Stopped before he got to the bag. Manager Dusty Baker immediately yanked him from the lineup, replacing him with Laynce Nix. As far as I’m concerned, and many other fans are concerned, Taveras can rot on the bench the rest of the season. I’ve seen nothing to merit the millions the Reds have flushed down the toilet when they brought this guy in. Baker said Taveras hurt himself early in the game when he bunted and dove head first into the first-base bag as the ball rolled foul. He stayed in and couldn’t run the next at-bat. “I knew something was wrong when I saw him not run, because that’s not Willy,” said Baker. It's refreshing to see that type of unapologetic, honest criticism in the coverage of the team. The wheels have completely come off for this team over the past month and Hal is giving voice to the mounting frustration of the fan base. Even in sports coverage, the purpose of the fourth estate is to inform people of what's going on in the world and to keep the powers that be honest. I saw Willy T's swinging bunt and leisurely stroll down to first base and he didn't look hurt. He looked completely and utterly disinterested. Like Hal, I can't deny that he was injured, but it's not the first time Willy T has completely underwhelmed. It's difficult to imagine a player with absolutely no hitting ability who feels so secure in his job that he's comfortable giving less than his all. When you are a marginal player (to put it generously), it's a good idea to give it 110% in everything you do. Willy T just isn't that type of player. For a small ball player whose game is predicated on doing the "little things," it's remarkable just how poorly he does many of those "little things." In this case, we have a front office and manager who don't quite seem to get it. When Dusty was hired, I almost couldn't believe it. He was quite literally the last person I would want managing my baseball team and this is part of the reason why. It seems to be obvious to everyone not named Dusty that Willy Taveras is an atrocious ballplayer. Willy is in the conversation for worst everyday ballplayer in all of Major League Baseball. But, Dusty keeps running him out there. Every. Single. Day. The blogosphere continues to rail against Willy T and the ignorance of Dusty Baker, but it's refreshing to hear the criticism come from inside the established media. Hal McCoy has a much louder megaphone than the rest of us combined and when he picks up the chant, maybe the organization will finally start to listen. At this point, the fans aren't asking for much. The season is over, but most of the fan base would still enjoy watching the young guys get their feet wet. It's time for the Reds to recognize the sunk cost on the roster (Willy T, I'm looking in your general direction) and call up the young players. The Reds need to use the remaining 6 weeks wisely and getting as much time to evaluate Drew Stubbs, Chris Heisey, and a few others would be the wise thing to do. Unfortunately, only those on the outside of the organization seem to recognize it. At the very least, Hal McCoy is saying what we are all thinking. Unfortunately, that won't be the case for very much longer. You will be missed, Hal. It is truly remarkable what has happened to this team over the past month or so. Granted, we were never the most talented team. Even so, the team was hanging around and on the cusp of contending through the first 3 months of the season. Things changed in a big damn hurry. On July 1, the Reds were 38-38 on the season, which was good for 3rd place. They may not have been quite that good, but their Run Differential on the season was only -14. So, they weren't too far from legitimate .500 ball. Fast forward to July 10 and the decline had begun. The Reds were still a respectable 42-43, but the Run Differential had collapsed to a -43. Obviously, the slide was on. Fast forward to July 24 and the W/L record began to reflect the Run Differential. The Reds had fallen to 44-51 with an eye popping -68 Run Differential. Perhaps not surprisingly, as the W/L record went into free fall, the fan frustration level increased at an inverse proportionate rate. It seems everyone can point to a specific game or moment in the 2009 season when they became bitter and frustrated with the Reds. Some fans point to the July 3rd game against the Cardinals when Homer Bailey tossed 7.1 strong innings only to see the game slip away when David Weathers served up an Albert Pujols grandslam. The combination of Homer taking a step forward only to see it go for naught was simply too much for some. Personally, I lasted a bit longer. I flipped my lid over the July 6th game against Philadelphia. Surely you remember, the 22-1 shellacking? That was the moment I knew that the season was over. Good teams are tough and gritty. Good teams demand respect. Good teams show some fight when they're getting kicked around. They have pride. If the Reds were a good team, then they would have sent a message to the Phillies that game. They would have brushed hitters off the plate. Knocked a few guys down. They would have let the Phillies and everyone else know that the Reds don't appreciate getting kicked around. What did the Reds do? Well, Dusty Baker trots out Paul Janish to close out the game. Not surprisingly, Janish gives up 6 runs in an inning to make the Reds the laughingstock of the league that day. To me, that was the turning point of the season. Instead of showing fire and toughness, the Reds rolled over and died. What was your "Jump the Shark" moment for the 2009 season? Well, the card carrying members of the Reds nation can rest easy today. This weekend, the organization inked their top two picks from the 2009 draft, both of whom could provide a nice boost to the farm system. It seems that every year fans get up in arms and worry that the draftees won't sign, but every year the negotiations drag out to the last hour. Players electing not to sign and heading back into the draft the following year is mostly definitely the exception, rather than the rule. Agents use the paranoia of the organizations and fans to drive up the asking price, so it's not necessarily in the players' best interests to sign early. This year, the Reds got it done with a day or two to spare. The Reds signed RHP Mike Leake to a contract that includes a $2.27M signing bonus, which was ~$200,000 over his MLB slot recommendation. The Reds reeled in RHP Brad Boxberger for $857,000. Given that Leake signed for only ~$200K above MLB's slot recommendation, it's easy to wonder why the deal didn't get done earlier. It hardly seems like he was making unreasonable demands or driving a hard bargain. One possible reason for the delay in the signing could be the strategy of MLB of not approving contracts that exceed slot recommendations until right before the deadline. Before the draft takes place, MLB establishes recommendations for signing bonuses for draft picks. This tactic is designed to keep costs down and was implemented by the commissioner in 2000. According to Baseball America, first round signing bonuses rose 23.3% in the 1990s, but only 3.9% in the 2000s. So, at least in the big picture, it's a strategy that has worked. However, it's also a tactic that has rewarded teams willing to run afoul of MLB by exceeding slot recommendations. So, the benefits and burdens haven't necessarily fallen on all teams equally, which is a problem given that the amateur draft is designed to remedying competitive imbalance. It'll be interesting to see how the Reds handle Mike Leake for the rest of 2009. I've heard conflicting reports that he'll pitch in 2009 and that the Reds will shut him down. If the tendinitis he was battling has completely subsided, then I'd like to see him pitch a few professional innings in 2009. Given how conservative the Reds are with their prospects, I'd expect both Leake and Boxberger to start out in the Pioneer League or low A-ball. The Nationals find themselves in a rather interesting conundrum in regard to their first round pick, Stephen "best pitching prospect ever" Strasburg. First, it must be said, that it's in the best interests of BOTH Strasburg and the Nationals to get a deal done. The Nationals are a recent transplant to Washington, D.C. and it hasn't gone well. They have a new ballpark, which means that they will be in D.C. for the long haul. However, the Nationals are in dire need of a shot of legitimacy. They "won" the right to draft Strasburg by losing the more games than any other team in 2008. They are on pace to "win" the first pick in next year's draft by again dropping more games than any other organization. As for Strasburg, he was picked first overall, so he's not going to improve his draft status by returning to the draft in 2010. In fact, unless he would be willing to sign a "redraft approval" to allow the Nationals to draft him again in 2010, Strasburg would be selected no higher than 3rd. The Nationals will likely get the #1 overall pick on merit and they would be awarded the #2 overall pick as compensation for not signing Strasburg. It's difficult to envision anyone giving Strasburg significantly more money when he is the 3rd overall pick in 2010 than when he was the 1st overall pick in 2009. In addition, given that he is such a polished prospect, Strasburg would likely spend the entire 2010 season in the Nationals' rotation. That would give him an entire year of service time, which would move him one year closer to free agency. If Strasburg sits out the entire 2010 season, then he will not earn any service time. Instead of hitting free agency in 6 years, he will instead require 7 years. And, that extra year will cost one season of "prime of his career" salary. By sitting out, Strasburg will cost himself one year of free agent level earnings (maybe ~$15-20M) that he'll never get back. To make sitting out a year worthwhile, Strasburg would have to get ~$10M more from the team that drafts him in 2010 than what he would receive from the Nationals. Obviously, there is an argument to be made that Strasburg should hold out for more because he could get injured during the course of his career and never reach free agency. However, that argument would seem to be countered rather effectively by the chance that Strasburg could get injured pitching in independent ball while waiting for the 2010 draft and never get a big pay day at all. In short, Strasburg and the Nationals need each other. However, there are long-term considerations at play that may derail the deal. Clearly, uber-agent Scott Boras is trying to use Strasburg to completely redefine the established benchmarks for MLB signing bonuses. If he can get Strasburg significantly more money than any previous draftee, then that will have a significant trickle down effect on all high draft picks in the future. And, of course, on Boras's bank account. For Boras, Strasburg isn't simply another player, but rather a significant opportunity. Strasburg is the best chance Boras has had to explode the draftee pay scale in MLB. As for the Nationals, they too have future considerations to take into account. The Nationals are bad enough that they will likely receive the 1st overall pick in 2010. Fortunately for the Nats, they will likely again have the opportunity to draft a "once in a generation" talent in catching prospect Bryce Harper. However, it's obvious that the starting point for the negotiations with Bryce Harper will be the contract given to Stephen Strasburg. In essence, the Nationals are setting their own benchmark for their negotiations with Bryce Harper. Whatever they give to Strasburg will be the floor in their negotiations with Harper. So, if they exceed the previous signing bonus record by $5M to sign Strasburg, then they'll have to do it again in 2010. Ultimately, it makes too much sense for both sides not to get a deal done, but it'll go down to the final minute. Regardless, given the escalating cost of the #1 overall pick in both the NFL and MLB, expect each league to address the issue in the next round of Collective Bargaining. The draft is a mechanism for addressing competitive imbalance, but it has to be considered broken if the worst teams cannot sign the best prospects. Well, time for a quick and dirty update as to our top prospects. This one is much more off the cuff than what I do over the offseason and obviously incorporates only half of the 2009 season, but here are some initial thoughts about our system. Obviously, Stewart and Roenicke are no longer eligible, guys like Dickerson and Fisher have graduated, and recent draftees like Mike Leake are included. Hamate bone fracture or not, Yonder still resides on top of the heap. He is limited to 1b, where his bat will determine his success. Fortunately, Yonder has the hit tool necessary to be an impact player at the MLB level. In addition, he controls the strikezone very well, which gives him the added advantage of top notch OBPs. On the season, Alonso has a line of .284/.357/.466, which isn't massively impressive, but when coupled with his upside makes him the top prospect in the system and one of the top prospects in all of baseball. Travis Wood has always intrigued me. He has clean mechanics and I love pitchers with top notch change-ups, but he lacked the effective breaking pitch needed to be successful at the professional level. Obviously, that all changed in 2009 when Wood scrapped his inconsistent curveball in favor of a cutter, which has unlocked his potential and made him one of the best pitchers in the minors this year. The new arsenal has not only improved Wood's walk and strikeout rates, but has really limited hard contact when opposing hitters do put the ball in play. 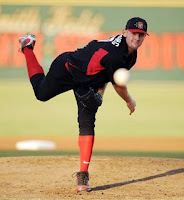 In 137.2 innings between double-A and triple-A Wood has a 1.44 ERA and a 116/46 K/BB ratio. Just as impressively is the fact that he has allowed only 4 homeruns despite a neutral GB/FB rate of 0.99. He's not limiting homeruns by keeping the ball on the ground, but rather it seems that opposing hitters just can't square the ball up. His cutter is really limiting hard contact against him. In 2009, Wood's cutter seems to allow him to keep the ball off the barrell of the bat, while his changeup continues to rack up the strikeouts. The concerns about his size and lack of velocity still remain, but Wood's 2009 season has solidified his prospect status and catapulted him into the discussions for the 2010 MLB rotation. Leake has yet to throw a professional pitch, but his upside is considerable. Leake is polished and has a tremendous baseball IQ. While he's unlikely to be a true #1 starter, his polish and maturity makes him one of the lowest risk pitching prospect in the 2009 draft. And, given the Reds recent history in the draft, low risk isn't such a bad thing. It'll be interesting to see how quickly he adjusts to the professional ranks. He should be signed before the August 17th deadline. I think Reds fans will like Mike Leake. Rodriguez is already flashing the overloaded tool set and the massive upside he was reported to possess. I always thought he had more polish than Juan Duran, but he's been even more polished than previously thought. 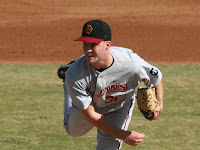 He made his debut in the Gulf Coast League, but was promoted up to rookie league Billings Mustangs. In the two stops, Yorman has a line of .270/.348/.377/.725 a 41/15 K/BB ratio and a 6/0 SB/CS mark. Given that he won't even turn 17 until August 15th, his performance is very impressive. Not many prospects that age could hold their own against such an advanced level of competition. The sky is seemingly the limit for Yorman. 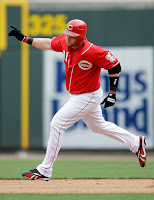 For me, the biggest concern on Frazier is how the Reds are handling him. He's a baseball player through and through. His tools play up because of his understanding of the game. However, his bat likely isn't strong enough to make him an above average leftfielder, which is where the Reds have been playing him. The Reds have yet to lock him into a defensive position, which is an odd way for an organization to handle a legitimate prospect. The way the Reds are developing makes it seem like they view him as a utility player, rather than a full-time starter. 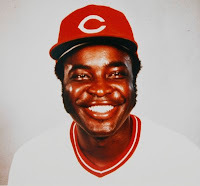 The obvious thing to do was to develop Frazier as a third baseman, where his bat would be more valuable. 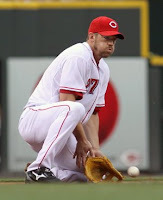 However, the acquisition of Scott Rolen changes that, so it's unclear where Frazier will end up. Though, as of late, he has seen time at second base. Stubbs continues to be Stubbs. He's flashing strong on base skills, speed, and defense, but is not hitting for a high average or power. Stubbs can be a solid MLB centerfielder based on his plus defense, on base skills, and ability to steal bases. However, he's much less interesting and valuable as a prospect if he can't provide 20 homerun power or a high batting average. On the season, Stubbs has a .280/.368/.379/.748 slash line for triple-A Louisville. Not bad, but not all that impressive either. Soto has underwhelmed this year. The Reds sent him to high-A Sarasota, where his offensive numbers have suffered. This is not entirely unexpected, as Sarasota is a tough place to hit. 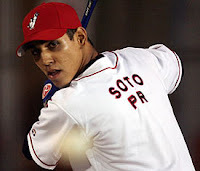 On the year, Soto is at .241/.278/.365/.643 with 10 homeruns and a 71/18 K/BB ratio in 386 At Bats. His walk rate still leaves much to be desired, but he doesn't have the massive strikeout rate that will preclude him from hitting for a high average as a climbs the ranks. He could be a high average and high power offensive player. It's been a down year, but not one that should diminish his prospect status all that much. If he can rebound in 2010, then all is forgiven. Time is on his side. Heisey exploded in 2009, forcing everyone to pay attention. I had him pegged as a 4th outfielder type. A nice player, but the kind of player who was a "jack of all trades, but master of none" type. However, he eviscerated double-A pitching to a tune of .347/.426/.572/.998, which obviously earned him a promotion to triple-A. He has slowed since the promotion, hitting .298/.326/.450/.777, but he has made enough noise to warrant consideration as a legitimate prospect. His ability to handle centerfield makes gives him an added boost in the prospect department, as his bat doesn't need to carry him. It'll be interesting to see if his performance at double-A represented a new baseline of performance or was just an unsustainable hot streak. 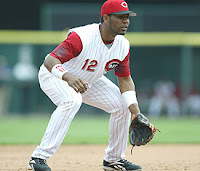 Cozart has taken his offensive game to a new level in 2009. That step will go a long way towards making him a legitimate option as a starting shortstop at the major league level. At double-A Cozart is hitting .270/.366/.420/.786 with 9 homers and a 68/47 K/BB ratio in 352 ABs. He'll never be an impact offensive player at the MLB level, but he could be something more than an automatic out. Defense will always be his calling card and it, if it's as good as they say, then he could be the future at shortstop for the organization. Sulbaran made a lot of noise before ever throwing a professional pitch. He flashed impressive skill in international competition, but his first professional season hasn't been all that noteworthy. The Reds sent him to low-A Dayton where he has pitched 64.2 innings and posted a 4.87 ERA, 1.56 WHIP, and a 72/38 K/BB ratio. Obviously, the big problem here is the walk rate. A BB/9 up over 5.0 just isn't acceptable. In addition, he is giving up a lot of flyballs (GB/FB: 0.56) and homeruns (12), which isn't all that unexpected from a power pitcher. Still, cutting down on the longballs will be necessary in the future. However, the strikeout rate is stellar and bodes well for the future. Sulbaran's performance in the international game created big time expectations, but he has suffered the same struggles that plague most young pitchers. Still, his stuff is impressive and his future is bright. Duran joined Yorman Rodriguez in the Gulf Coast League, but hasn't performed as well as Yorman. That's not unexpected, as he has always struck me as the less polished of the two. In fact, Duran doesn't seem all that uncomfortable in his body after a massive growth spurt that saw him shoot up to 6-5. He has good athleticism and upside, but he'll likely take longer to reach it than Yorman. On the season, Duran is hitting .180/.235/.270/.506 for the Gulf Coast League Reds. Not impressive, but he's so young that it doesn't mean all that much. Struggles were to be expected, but the future remains bright. Mesoraco continues to underwhelm, but I still think patience is advisable. Again, a combination of factors all indicated that Mesoraco would have a long development curve. As a high school catching prospect from a cold weather school who lost a season to Tommy John surgery, it was inevitable that he would be slow out of the gate. This year, it would have been nice to see something more from Mesoraco on the offensive side, but instead he has a .222/.307/.376/.683 for high-A Sarasota. Again, that's a tough environment for hitters and I wouldn't be surprised to see a significant step forward in 2010. His overall production isn't great, but the peripherals aren't bad. His walk rate is good and his power isn't bad. I'm willing to be patient on Mesoraco for another year, but 2010 is the time for him to really show something. It's been a wasted year for Valaika. He suffered through injury and his production is awful. For triple-A Louisville, Valaika is hitting .197/.237/.299/.536. The 2009 season can't end fast enough for Chris. Maloney has been stellar in 2009...at least in the minors. For Louisville, Maloney has a 2.72 ERA, 1.13 WHIP, and 97/16 K/BB ratio. He didn't embarrass himself in the majors, as evidenced by his 14/5 K/BB ratio in 17.2 innings, but he was stung for 6 homeruns. Maloney still looks like a serviceable backend of the rotation MLB starter, but he may never been a good fit in Great American Ballpark. If he stays in the Cincinnati organization, he may be nothing more than a 4A player. I'd like to see him get another shot. Time will tell. Like Valaika, Dorn's season has been a waste. Always a slow starter, Dorn seemed to have more trouble kicking it into gear in 2009 than in year's past. In his first taste of triple-A, Dorn has a .256/.323/.446/.769 slash line. Not all that impressive, but the Reds moving him around the field and bouncing him in and out of the lineup can't help. Still, I expect him to finish strong and bounce back in 2010. Live armed southpaw. Stellar strikeout rate, but too many walks hinder his performance. Still, he's the type who could flip the switch and become something special. Surprising, not necessarily in a bad way, to see the Reds use him in the bullpen all year after finishing strong in the rotation in 2008. Still, shortage of starting pitching could lead the Reds to try him in the rotation again. Francisco has over 30 errors on the season at 3rd base. He's clearly not a viable option over there, which is very problematic. Frankly, he doesn't have the glove to handle any position other than the "offense first" positions. And, he doesn't have the offensive game to hold down the "offensive first" positions. Still, Dusty seemed to take a shine to him in spring training. Be afraid, be very afraid. Yet to throw a pitch in anger, but an intriguing prospect. I like Fellhauer. He has a sweet line drive swing from the left side. His professional career will likely be driven by his ability to stick in center. He probably won't have the bat for a corner outfield spot. Still, he's off to a rocking start for Dayton, where he has a .309/.375/.545/.920 line on the season. He's a polished prospect from Cal State Fullerton, so his success at low-A isn't surprising, but it's encouraging nonetheless. Oliveras started out the year with the Billings Mustangs, but was bumped up the ladder to Dayon when Yorman Rodriguez was promoted to Billings. At Billings, Oliveras had a .270/.326/.352/.678 line with 7 stolen bases. At Dayton, Oliveras has stepped it up a notch, posting a .333/.351/.611/.962. Oliveras has a bit of electricity in his game. He has good speed and provides solid outfield defense, but he'll need to improve either his on base skills or his power to climb the prospect ladder. Josh Ravin is a personal favorite and he was on the road to reestablishing his prospect status when an elbow strain shut him down at the end of June. Still, it was a positive step forward. Hopefully, he can get back and finish out the 2009 season strong. Lotzkar has the tools to be a successful pitcher, but he also has a healthy injury risk because of his mechanics. He suffered from a stress fracture in 2008 and reaggravated it, which will keep him out of the entire 2009 season. Best hope is that he comes back 100% for 2010 and never suffers a reoccurrence of the injury. I was concerned about his injury risk before and it's only heightened now. Hamilton was one of the best athletes in the 2009 draft class. However, great athleticism doesn't always translate into the specific skills necessary for success in professional baseball. The Reds sent Hamilton to the Gulf Coast League where he has a line of .207/.275/.239/.514 on the season. On the plus side he has swiped 13 bases in 15 attempts. If the athleticism translates, he could be special. Or, he could be another in a long line of great athletes who have been frustrated by baseball's refusal to bend to their will. A southpaw out of Florida State who has performed well in 2009. At both levels of A-ball, Fairel has posted a 2.94 ERA and a solid 115/42 K/BB ratio in 122.1 innings. He'll need to sustain his level of performance against more advanced competition to confirm his prospect status. It's not too unexpected for a college pitcher to perform well in A-ball, so his prospect status will be determined by his performance against more advanced competition. Rojas is a good glove infielder who is developing on the offensive side of the game. He's pushing Zach Cozart for best defensive shortstop in the system. Whether his bat will play is another question, but he is starting to make progress at the plate. I'll get this out of the way right now. I know I'm one of the few, but I like what the Reds have done here. It's not easy to restructure a roster, but the Reds have needed to do just that for years. They began the process last year by trading away Adam Dunn and Ken Griffey Jr., but finally completed it by trading away Edwin Encarnacion. He was the last player who obviously needed to go. 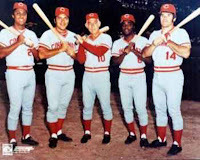 For far too long the Reds were built like a beer league softball team. As the new defensive metrics continue to develop, they reveal more and more the true value of defense. Unfortunately, the Reds have been locked into a 25-man roster that largely prevented them from being a good defensive team. The presence of Adam Dunn, Ken Griffey Jr., and Edwin Encarnacion gave the Reds no roster flexibility and no chance at fielding even a competent defensive club. Finally, with this trade, the Reds no longer have any significant defensive liabilities. Completely restructuring a 25-man roster is a significant challenge and, at times, it can be painful, but this was a necessary move for the Reds and one that makes them a better team in 2010. The Reds traded Edwin Encarnacion, Zach Stewart, and Josh Roenicke to the Blue Jays for Scott Rolen. I still haven't seen the definitive word on whether money is changing hands in the deal, but if the Reds can get the Jays to pick up some of the contract then it looks more favorable for them. Of course, the hue and cry in the Reds nation is that the Reds overpaid. Frankly, I just don't see it, as that train of thought is based on fans 1) overvaluing Edwin, 2) the prospects we gave up, or 3) both. As it stands, Edwin simply has no trade value. In fact, in light of his escalating salary, he may have actually had negative value. When rumors of this trade were first raised in the press, it was clear that the Jays had no interest in Edwin. It's a reasonable inference that the real value in this deal for the Jays came from Stewart and Roenicke. Edwin went along for the ride to give the Reds some salary relief. Unfortunately, Rolen isn't quite the offensive player he was once. A shoulder injury has robbed him of some of his power, but in 2009 he has made the adjustments necessary to be an effective offensive contributor. On the season, Rolen is hitting .316/.366/.471/.837 and while he has a .342 BABIP, his performance is not the result of luck, as he has a stellar linedrive rate of 24.9%. 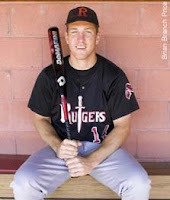 On his career, Rolen has a slash line of .284/.370/.500. And, while the big power numbers are unlikely to return, his overall production should be solid. As for Edwin, his career slash line of .262/.344/.449/.793 has been characterized by massive slumps and never ending inconsistency. He has always appeared to have good upside, but is no closer to reaching it than when he first arrived. 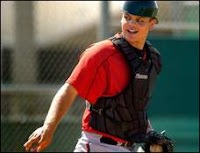 If he can stay healthy, Rolen should be an upgrade on offense. In 2009, Edwin has sunk to a whole new level on defense. I didn't think it was possible to get worse at the hot corner, but he has managed to do so. I really don't think most people appreciate just how detrimental his defense is to the performance of the team. In 2009, Edwin has a UZR (Ultimate Zone Rating in Runs Above Average) of -6.0 and a UZR/150 (UZR Runs Above Average per 150 Defensive Games) of -23.1. His career UZR/150 is -12.2. He doesn't fare any better under John Dewan's +/- system. In 2009, Edwin has a -10 rating, which translates into -8 Runs Saved. In a mere 362.1 innings, Edwin has cost the Reds 8 runs more than the average third baseman. That ranks him 30th among third basemen. Basically, he's dead last among 3b, despite having missed a significant amount of time with injury. On the other hand, Rolen is still stellar with the leather. He's not quite what he used to be, but he remains a strong defensive third baseman. In 2009, Rolen has a UZR of 4.8 and a UZR/150 of 7.9. Under the +/- system, Rolen is a +18, which translates into 14 runs saved. So, he's been 14 runs better than the league average 3b. Defensive metrics still aren't without flaw, but when the findings of one are supported by another, then you can feel more confident in what they reveal. If you look at these measures, then it seems fairly safe to say that the Reds are going to save roughly 28-30 runs on defense by going from Edwin to Rolen. Give or take, Edwin is ~15 below average, while Rolen is ~10 runs above average. As a general rule of thumb, a win is considered to be worth ~10 runs. That number is arrived by looking at all the teams throughout baseball history who have scored one more run than they have allowed per game, and finding that they have a .600 win percentage. In addition, the teams that have allowed one more run than they score have a .400 win percentage, which means that each additional run leads to .100 additional wins. If Scott Rolen can stay healthy and play something resembling a full season, then speaking strictly from a defensive point of view the Reds are improving in the Win column by ~2.5 wins. Most of the complaints about the deal focus on the loss of Zach Stewart, and, to a lesser extent, Josh Roenicke. Stewart really opened some eyes this year, as he proved to be much more than a raw, live-armed college closer. He made 14 starts between high-A and double-A ball before being promoted to triple-A, where he was shifted back to the bullpen to limit his innings pitched. For high-A Sarasota, he posted a 2.13 ERA, 1.30 WHIP, and a 32/8 K/BB in 42.1 innings pitched. In addition, Stewart had a stellar 2.42 GB/FB ratio. He was quickly promoted to double-A, where he kept on rolling. He posted a 1.46 ERA, 1.05 WHIP, and a 31/10 K/BB ratio in 37.0 innings. He also continued to pile up the groundballs, posting a 1.96 GB/FB ratio. As for Roenicke, I like him more than most. He's got a very live arm, keeps the ball down, and gives up few walks. He's an intriguing power arm with the potential to work high leverage innings. In the minors, he had a 2.57 ERA and 32/6 K/BB ratio in only 28.0 innings. Roenicke also induced his fair share of groundballs, as evidenced by his 1.60 GB/FB ratio. Not only did both prospects have good numbers, but they also have plus stuff. Neither relied on smoke and mirrors to post their production, so these certainly were legitimate prospects with value. 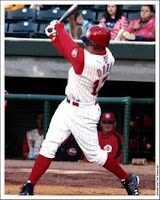 Ultimately, I think Rolen will have a very positive impact on the Reds in 2010. His defense alone will be a significant improvement and he should also provide the type of quality righthanded bat that we have lacked in 2009. When paired with Brandon Phillips, a healthy Scott Rolen should work to counterbalance the lefthanded bats of Joey Votto and Jay Bruce. Unfortunately, the Reds had to give up Roenicke and Stewart to acquire Rolen. I suspect that Roenicke had to be included to get the Jays to take Encarnacion. By including Edwin in the deal, the Reds save $4.75M in 2010, which effectively reduces Rolen's cost next year to $6.25M. Early reports are that the Jays are picking up the rest of Rolen's salary in 2009, so the monetary implications of the deal are fairly good for the Reds. Of course, it would have been nice if the Reds could have acquired Rolen without giving up Roenicke or Stewart. However, given that the Reds already have a lot of good young talent on the team and in the rotation, it hardly seems unwise to deal away prospects for established veterans who can help at the MLB level. The purpose of the farm system is to support the MLB team, which can be done both by promoting prospects or by trading them away. Stewart certainly exploded onto the scene in 2009, but to me his ceiling seems to be that of a #2 starter and he's no sure bet to reach that ceiling. In fact, I wouldn't be at all surprised to see him top out as a #3 starter or even a closer. The idea that he's a future #1 starter or Cy Young winner based on a mere 14 start sample size seems more than a little overly optimistic. Personally, I wish we could have kept Josh Roenicke, as he is the more likely of the two to contribute at the big league level in 2010. Still, given the volatility of relievers, they are usually fairly easy to replace. However, I fear that may not quite be the case with Roenicke. Ultimately, there is a great deal of inherent risk in pitching prospects and Stewart is more likely to end up a #3 starter or worse than he is a #1 starter. In addition, I still have a question or two about his mechanics, which may reduce his ability to handle a 200+ inning workload on an annual basis. To me, Stewart would have to develop into a legitimate #1/2 starter for me to lament his departure and I question his ability to do so. Despite their recent struggles, the Reds seem rather close to being competitive. By adding a veteran righthanded bat and improving the defense at the hot corner, the Reds should be much improved in 2010. After the Rolen trade, the Reds seem to be an impact bat and a healthy pitching staff away from being a tough team to handle next season. I'd be surprised if the Reds didn't extend Rolen's contract to keep him in Cincinnati beyond 2010, so if he can stay reasonably healthy over the next few years, then the Reds should be a much improved team. The Reds certainly gave up good talent in Roenicke and Stewart to do it, but a healthy Scott Rolen puts the Reds one step closer to a postseason birth.